Ecommerce chatbots are becoming increasing common as companies discover that this form of artificial intelligence can be a useful marketing tool. This is particularly true for small businesses without the resources to provide live chat services around the clock. Although the method by which business uses ecommerce chatbots can vary by industry and target audience, they can serve several functions. They may work to complete a customer’s purchase, offer recommendations for products based on history or expressed preferences, or provide customer support at times when live agents are not available. Some business owners have expressed concern that the AI won’t be good enough to please customers since the technology is relatively new. But large companies are already putting them to use at scale with solid results. Staples, for example, uses a chatbot in Facebook Messenger to provide product suggestions and let customers make purchases directly from the chat. Sephora uses chatbots to deliver product suggestions and makeup tips, followed by a link to the app or website to make a purchase. H&M also has a chatbot which asks users stylistic questions and then makes suggestions. Other major brands with successful chatbots include eBay, SnapTravel, Aerie, 1-800-Flowers, and Pizza Hut. An ecommerce chatbot can offer several customer engagement and sales benefits. These tools improve customer interactions as conversational assistants, acting as a salesperson, or serving as a customer care assistant. One study found that nearly 89 percent of messages requiring a response on social media go ignored, and for those that are addressed, it takes an average of ten hours to receive a reply. Ecommerce chatbots can dramatically improve both of those figures. Chatbots also offer advantages over traditional employees, like the ability to offer customer service via artificial intelligence at any time of the day, 365 days a year. A chatbot can handle multiple conversations at once. Overall, chatbots deliver consistent communication that is context-driven and cost-effective. Chatbots can be programmed to serve additional functions like tracking your inventory so you know if you run out of an item sold through your online store. Since the chatbot already uses AI, it is a natural extension for the collection of data that you can use to gain insight into your ecommerce brand. Facebook Messenger is a good starting point for your first chatbot, assuming your company has an active Facebook page. Because most of your customers likely already have a Facebook account, this is a quick way to provide a resource that most people will be able to use. 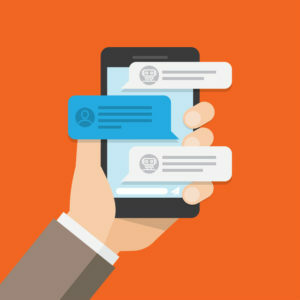 Building a chatbot is best left to those who have a very strong grasp of the technology behind them, as well as an understanding of what customers want from a conversation. A large part of this process, however, involves programming the system to answer common questions and concerns that your customers voice. Whether you hire a professional or not, you will need to remain heavily involved in the creation process. Chatbots are a useful tool for ecommerce companies of any size, allowing you to increase customer engagement and provide basic customer service with minimal research. As chatbots grow in popularity, it becomes easier for ecommerce businesses to customize their own, either themselves or via an external company.